Based on that comment and according to Ashley Parker et al., "The president worried that Gorsuch would not be loyal." There you have the attitude that will be the death of an independent judiciary. Do you need a roadmap for where this man intends to ditch the body? --the mangled body of the Law, the administration itself of justice, the independence of a judiciary that is by its own ethical rules non-partisan. Does Trump's plain disrespect for judges not remind you of what Phil Berger wants to ram through the General Assembly -- the complete subjugation of judges and the imposition of an authoritarianism that equals nothing on this side of the Atlantic in blessed memory. 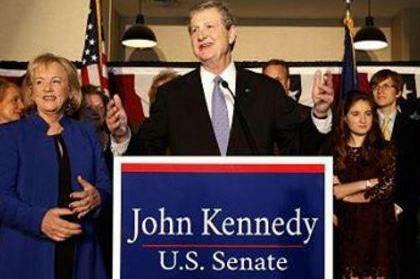 In Washington, Senator Kennedy has become a favorite with reporters. He likes to talk, and he's not shy with the opinions. He complained three weeks ago to reporters that the White House was ignoring his concerns about the subpar quality of President Trump’s judicial nominees. “It’s like talking to the wind,” Kennedy said. According to sources harvested by James Hohmann, Kennedy may be taking some revenge on White House Counsel Don McGahn, who early in Trump's term ignored Kennedy's wishes in picking a Trump nominee for US attorney in New Orleans. Hmmm. Diss the newly elected Republican senator from Lousy-anna, will you? Well, we'll see about that! Both dearly departed judgeship nominees Michael Petersen and Brett Talley -- and Gregory Katsas too, who barely made it to the bench, with Kennedy voting no -- all three were closely connected to and mentored by Don McGahn. Katsas was his deputy White House counsel. Talley is married to McGahn's chief of staff. Their sudden fall at the hands of Senator Kennedy might be a stitch too coincidental.